Saturday proved to be a brilliant day for a ski tour, plenty of snow and not a cloud in the sky. The six of us set out from Färiche, a few minutes from Lenk, at around 10 am with the intention of having lunch on the Iffighore. A popular and well frequented route in the region, the Iffighore is roughly 1200 m climb spread out over 5.5 km, rising past the tree line and numbered 650b. From the mostly gentle ascent on its wide whale back, the Iffighore offers striking views across the north faces of the Wildstrübel all the way westward to the Wildhorn, still apparently distant from this vantage point. The Wildhornhütte, our destination for the day, lies in the valley southward below, and appears about halfway up the route. On the northern side, much of the Préalpes Bernoises were visible in the excellent visibility. Eventually, the Tungelgletscher appeared, it is part of the route up to the Wildhorn. Here, a small plane made intrepid landings, follow by immediate take-offs, most likely a training exercise. Definitely a fun experience – my father often mentioned taking part flights like these, glacier landings follow by tours on peaux de phoque, when part of the SAC section Biel back in the late 50s early 60s. After pleasant ascent and a gemutliche lunch break, we headed down the Iffigshore’s southwestern face. A trio of Frenchmen dressed in tights we had met earlier had warned us of possible glide avalanches and advised us to stay well to the right hand side of the slope. Indeed, as we made our way down, we could contemplate from close proximity a reasonably large glide avalanche which seemingly occurred earlier in the week. The way down from Iffighore now led us to the Iffigsee, about 1 km and -300 hm, frozen over at this time of year but immediately discernable. From there, the slope rises in a couple of easy steps, 1.5 km and 200 hm to the Wildhornhütte, which we must have reached around five in the evening. It is a small building, mostly of stone, with five floors, and set in a hollow of snow as high as the building itself, testament to the favorable winter season of this year. The evening was spent over bowls of hot soup and stew, planning for the morrow, roughly 940 hm over 4 km. Sunday didn’t announce itself to be as sunny at Saturday, rather cloudy in fact, and this lent a slight atmosphere of apprehension to our otherwise very lively evening. Luckily, Kirsten kindly secured us a six bedroom dorm, which made for a very quiet and pleasant night – although someone was immediately accused of sonorous snoring first thing in the morning. At first light, we were on our way under somber cloud, the first out of the hut and well ahead of anyone – quite usual for AAC Basel Liselotte assures me. In fact, we were so early and the fog was so thick that we decided to take a little detour to the Schnidejoch, a fork in the normal route which leads down to the “Lac de Ténéchet” and onto the Wildstrübelhütte. This circuitous route was planned with much forethought and numerous objectives: so as exercise our navigational skills, perhaps catch a glimpse into the Valais, and also most importantly, to regal ourselves by plowing, isolated and under menacing cliffs, through the virgin powder snow of the Chilchligletscher, an exercise manifesting what little romanticism is left mountaineering in the Swiss Alps out of sight of the crowds. From this minor deviation we rejoined the normal route, still in thick fog and to boot far ahead of anyone else. The pea soup meant we stopped often, each us confirming our position and trajectory and trying to make the most of our navigational aids rather than blindly following a mere track – who knows where it could lead? Cabanne des Audannes on the other side of the mountain for all we knew! Being the first group on the top, we could note that the Wildhorn has two summits; the first is steep and comprises a rather narrow arête, more suitable for people on foot or on snow shoes than skis. The second, a little further on, is a board flat which can easily accommodate the crowds, which by this time were materializing through the mist. Brunching on the summit, a fine blue sky appeared through breaks in the cloud, and in the distance the Mont Blanc and several well-known géants du Valais made frequent appearances. The chill wind soon drove us down – after half an hour – for a bout of fantastic skiing. We even joined Tunggelgletscher about half way down. 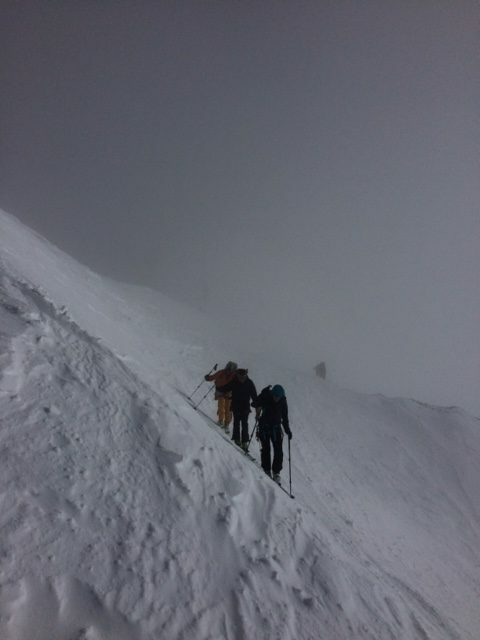 It can be reached quite early on, although in our case its north-facing aspect, pronounced steepness and deep snow drifts, made us rather uneasy about skiing down it. The final decent to the hut is steep – some parts over ~40°, but with a thick blanket of power snow it is a great pleasure to ski. After a much appreciated drink – thank you Roman – we headed once more off to the Iffighore, this time doing the route en sens inverse and once more in sunny weather. Encore we could admire the Wildhorn and note the numerous tracks down its glaciers – a very popular route indeed. 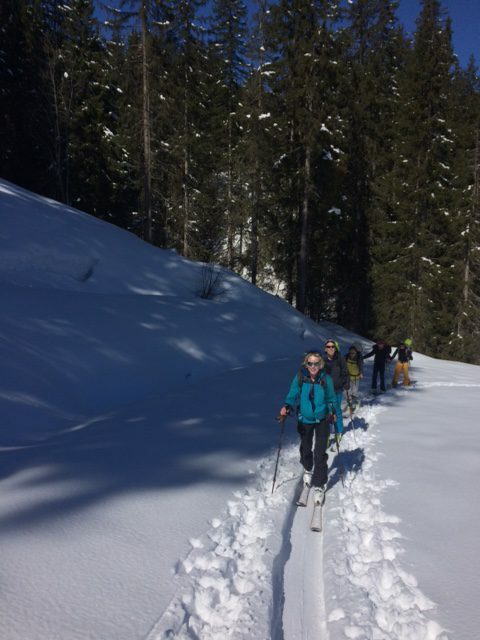 We arrived back in Färiche, content with a splendid decent in mostly favorable snow, by a route which offers plenty steep sections for the intrepid – some perhaps a little too steep as we soon found out with Liselotte! Safely arrived, Roman boldly hailed a couple of friendly locals in their cars – whom didn’t think twice about piling us into their cars and thoughtfully disposing of us at the train station. All in all a splendid weekend and a strong learning experience, thank you all for sharing your knowhow and good humor!